Basel, which lies in the northwest region of Switzerland, near its French and German borders, is a delightful city with a rich history, intriguing medieval quarter, fabulous art galleries and stunning architecture. 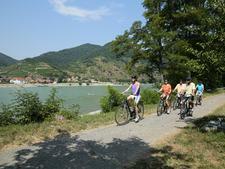 It also boasts a lively social scene, much of which focuses around the city's most important asset, the meandering Rhine River. The mighty river first becomes navigable at Basel, which makes the city the nearest thing landlocked Switzerland has to a seaport, and residents really make the most of it. The river banks are lined with restaurants and hotels (which charge extra for a river-view room). Many residents use little tow-lined ferries rather than bridges to travel between Grossbasel (Big Basel, home to the medieval Old Town) on the south bank and Kleinbasel (Little Basel, center of the city's lively social scene) on the north bank. Basel is an important turnaround port for Rhine riverboats, many of which run between there and Amsterdam on weekly rotations. Because it's an embarkation and debarkation port, many river cruise passengers spend at least a day in Basel , which is no hardship, considering it's not only a fascinating city, but also a gateway to Alsace and Germany's Black Forest region. The landing stage for riverboat passengers is between Johanniterbrucke and Dreirosenbrucke, out in the suburbs. You cannot walk there from town. There's nothing much near the boat dock, just suburban streets. The best bet is to go to the tram station (an easy few minutes' walk away) and head for central Basel. Residents are very friendly and will help with directions. Most of the shops are closed Sundays. Main shopping hours in Basel are 9 a.m. to 6:30 p.m. Monday to Friday and 9 a.m. to 5 p.m. Saturdays, though big department stores tend to stay open later, until 8 p.m., and Thursday is late-night shopping day, when most city stores are open until 8:30 p.m. or 9 p.m. If you are in the city on a Monday and love art and culture, you might be disappointed because nearly all the city's galleries and museums are closed on that day. A notable exception is the Fondation Beyeler and Basel Munster. From the Airport: The EuroAirport Basel is located 15 minutes away from central Basel (by taxi). Alternatively -- if you're traveling light -- you can take a tram to the German railway station Badischer Bahnhof and pick up Bus No. 50 to the airport. Every traveler staying in a hotel in Basel receives a free Mobility Ticket when they check in. This is valid for 30 days and allows free use of Basel's excellent public transportation system; it also extends into the city (zones 10, 11, 13 and 15, including the airport). If you're staying in Basel before your river cruise, print out the hotel reservation confirmation and take it with you because you'll also qualify for free transport from the airport to your hotel if you show it to the bus or tram driver. By Tram: Basel is immensely -- and rightly -- proud of its transportation system, and tourist offices and hotels are very efficient at advising which particular trams you need to take to get to various parts of the city. Residents also are very helpful, and most speak English, at least to some extent. By Taxi: Basel prides itself on being an eco-friendly city, so extensive use of taxis is somewhat frowned upon and correspondingly expensive. A taxi from the city center to the EuroAirport costs about CHF 40, while a cab to the Swiss or German railway stations (SBB Bahnhof or Badischer Bahnhof/BBF) would cost about CHF 20. And that's without surcharges for trips in the evening or on Sundays. 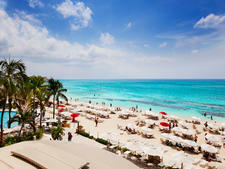 Taxi services include 33er Taxi AG (+41 61 333 33 33) and Taxiphon Genossenschaft (+41 61 444 44 44). By Car: All the major car rental companies -- including Hertz, Avis and EuropCar -- are represented in Basel. By Rail: If you want to go traveling before or after your cruise, Basel offers good rail links throughout Switzerland (including to Geneva and Zurich). 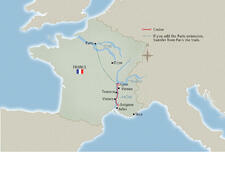 It also has fast links to destinations in France and Germany. Paris is about five hours away, Frankfurt just under four, Brussels about seven and Berlin nearly a 10-hour trip. 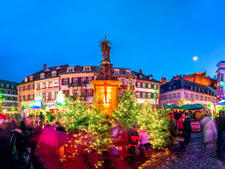 You can zip over to lovely Strasbourg in only 90 minutes. The currency in Switzerland is Swiss francs. For exchange rates, visit www.oanda.com or www.xe.com. Major credit cards are accepted in most hotels, restaurants and shops. Some taxis also accept credit cards, but it is worth changing some money if you plan to spend time in the city. Euros are not widely accepted, and even where they are, you could lose out badly on the exchange rate. ATM machines are located throughout Basel -- in banks and main post offices. 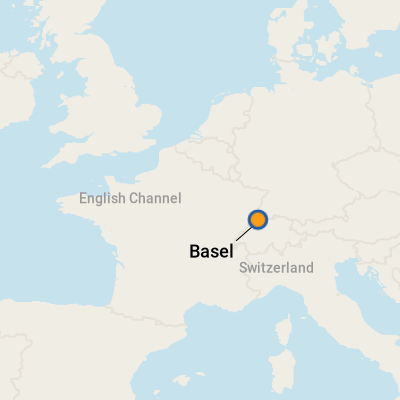 The official language of Basel is Swiss-German, but both French and English are widely spoken. In different parts of the country, you'll also hear people speaking German, French, Italian and Romansh. Considering its location in Switzerland's Dreilandereck (Three Countries' Corner), it's hardly surprising that Basel offers a great range of cuisine from Europe and further afield, alongside traditional Swiss specialities, cheese and chocolate (and, of course, the ingenious fondue sets that were designed to make the most of both). Basel specialities include Cakech, a tasty flour-based soup traditionally served during the city's Lenten Carnival period (Fasnacht), with cheese and onion tart. Even tastier options include Fire Bread -- a French take on pizza, with a deliciously light, crisp base and a variety of toppings -- and Zurcher Geschnetzeltes, thin strips of veal in a creamy mushroom sauce, usually served with another Swiss specialty, rosti potatoes. Sweet tooth? Pick up a bag of Massmogge, colorful long sweets filled with a chocolate and hazelnut mixture. You'll find them in shops year-round, but the greatest varieties are sold during Basel's Autumn Fair (Basler Herbstmesse), which takes place at the end of October. As for restaurants, you'll be spoiled for choice. Stroll along the Rhine riverbanks at lunchtime, check out the menus and simply take your pick (although be prepared for sticker stock; the U.S. dollar does not fare well against the Swiss franc). Swiss chocolate is obviously a big hit with visitors -- and because much of it features Alpine scenery, it's a good pictorial memento of your trip as well as a tasty one. You'll find plenty of chocolate in tourist shops, but if you're counting your Swiss francs, you can stock up at a supermarket; the packaging may not be quite as pretty, but it tastes just as good. But the real taste of Basel is Basler Lackerli, a deliciously crisp, waferish gingerbread baked with honey, nuts and spices, which was devised in the Middle Ages and is now a must-have in every Basel cookie tin. In fact, it's so popular, shops abound that sell just Lackerli. One such is the Lackerli Huus, which has locations throughout the city (at Gerbergasse 57, Falkenstrasse 34, Greifengasse 2, Bahnhof SBB/Passerelle and Stucki-Shopping 4051 Basel).